AP and I went to watch the Oklahoma City Thunder, the NBA’s newest franchise, at the BOK Center this evening. We hung out with some FCC friends. It was a great game and we had a great time. The Thunder even got the W with a “come from behind” victory over the Houston Rockets. Tracy McGrady was playing it safe and sat on the bench the whole game. Probably pretty smart given his history of back problems. We did get to see Yao and Ron Artest although neither played that well. The best player for the Rockets was Aaron Brooks. He was ON FIRE tonight, even getting a nice alley-oop in the 2nd quarter. Kevin Durant, however, was the player of the game. He was pretty quiet most of the night but down the stretch put on a show on both the offensive and defensive sides of the floor. 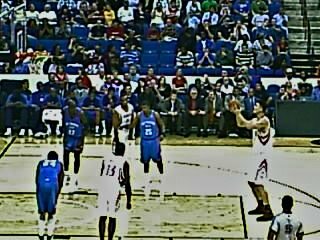 It was a rare treat to watch NBA basketball in Tulsa. I am really looking forward to catching a couple of games in OKC this season! For those of you who dont like sports sorry… its almost NBA season. I Love This Game!